From meatpacking to big tech, presidential contenders say market concentration is harming the economy. 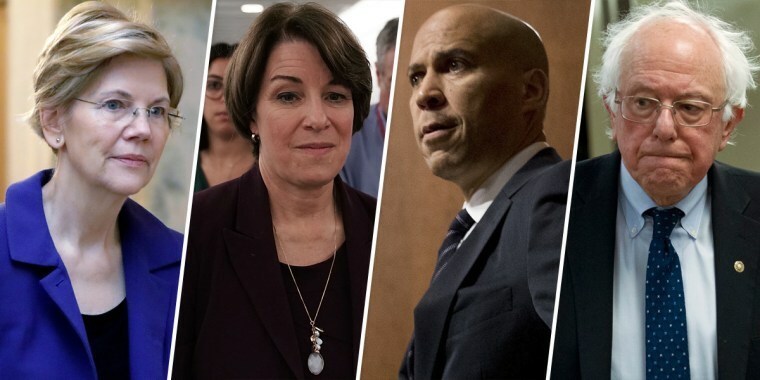 "Anti-trust had really been a dead language for 40 years on both the left and right," said Sarah Miller, deputy director of the Open Markets Institute, an anti-monopoly think tank that's co-hosting a 2020 candidate forum on the topic in Iowa on Saturday. "In 2020, we're really seeing antitrust have a breakout moment." Not to be outdone, Sen. Cory Booker, D-N.J., railed against consolidation in the poultry industry this month. In August, he put out legislation that would block all mergers between large agricultural, food and beverage companies for an 18-month period. "We have a major monopoly problem," she told The Washington Post this month. The hot word in Democratic policy circles these days is "monopsony," a scenario in which a few businesses dominate the labor market, giving them more leverage over wages and benefits as employees have fewer options if they want to leave. Some economists see it as a possible explanation for why wages have lagged behind economic growth since the recession. On the other side of the aisle, Republicans have shown some renewed concern about big tech as conservatives grow skeptical of social media companies' handling of speech and privacy. The Justice Department also sought to prevent a merger between Time Warner and AT&T. "In the ’90s, it was how Walmart is terrible and no one can compete against Walmart," he said. "Then it was Amazon, who competes against Walmart."